Summary (from the author's website): When Thomas wakes up in the lift, the only thing he can remember is his first name. His memory is blank. But he’s not alone. When the lift’s doors open, Thomas finds himself surrounded by kids who welcome him to the Glade—a large, open expanse surrounded by stone walls. My Summary: Thomas wakes up in a dark elevator, without any recollection of who he is or how he got there. The only thing he knows: his name. Other than that trivial piece of info, his memory has been wiped clean of anything and everything relating to his life before. The elevator finally stops and the doors fly open, revealing a crowd of teenaged boys of every age, size, and race. They welcome Thomas to "The Glade" - a huge field surrounded by stone walls. Ignoring his demands to be told where exactly he is and what is going on, the "Gladers" show him around, telling him that this place is where he'll be spending the rest of his life. Tom goes along, trying to find a way to get information, but after a few days of living in the Glade, he realizes something: he's been there before. But no one who enters the Glade ever leaves - not since people started showing up in "The Box" (the elevator) two years before. So how is it possible that Thomas has ever set foot in this mysterious place? And why did everything seem to spin out of control the moment he arrived? Questions keep piling up, as do people's suspicions that Tom is a spy sent by The Creators - the people who created the Glade and stuck the kids inside. And what does it mean when a girl - the first ever to arrive in the Glade - appears in the Box, with a message that throws the Glade into a state of chaos? My Thoughts: One word: woah. Actually, make that "WOAH! ", because that was my reaction upon reading the last sentence of the epilogue. This book was recommended to me by my English teacher, and I agreed to read it, even though it sounded a little too much like sci-fi (I'm more of a paranormal / contemporary / historical fiction type of gal, as you've probably picked up on). It's funny, though - this book was on my TBR list, but I took it off a few months ago, and now I end up reading it? Strange. Anyways, back to the review. The book started off a bit strangely - not gunna lie, I was just as frustrated as Tom was in the beginning, wanting answers and explanations and the like. After a few pages, though, I realized that the author had set up the beginning like that purposely and decided to just roll with it. Once I did that, the story became much easier to read. I sped through the first 90 pages, then took a break. The story had me on edge, though - I wanted to hurry up and get home so I could find out what was going on in the Glade! I ended up getting home a few hours later and immediately sat down to read more. Less than 3 hours later, I'm done the book, and I'm still in shock - it reminds me of my reaction to The Hunger Games the first time I read it, actually. That "no freaking way!" feeling hasn't gone away, and I've been thinking about the book for the past couple of hours now. It's one of those ones that haunts you, ya know? A few comments about the writing style: the author definitely has a gift for imagery! I felt like I was right there in the Glade - I have a clear picture in my head of what the entire place looks like. I had some trouble with the slang the Gladers used at first, but it's relatively easy to figure out what they mean through the context they're used in... not to mention the fact that some of the words rhyme with their 'synonym'. That's all I can say about that, though! Overall, the writing was clear and descriptive. Final Thoughts: I really, really liked this one! It was a little darker than the stuff I usually read, but it fit really well with everything else. I recommend you check it out, especially if you loved The Hunger Games! Quote: "He wanted to be able to protect his friends from the horrible experience, but he knew he couldn't. 'We can do it,' she said in a quiet voice. 'Holy crap, you're human. You should be scared.'" 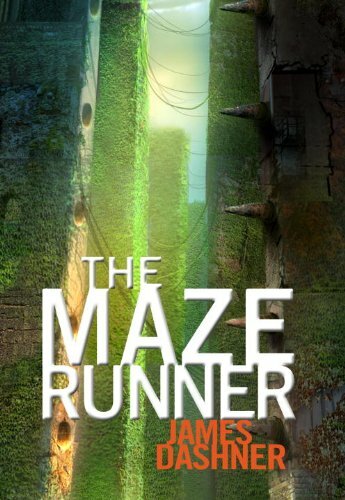 The Maze Runner is one of my favorites, and I'm so glad you liked it! Have you read The Scorch Trials yet? Even better than The Maze Runner! Interview & Giveaway with Author Tami Jackson!